These beautiful mahogany wood Etz Chaim Torah Rollers are handcrafted for strength and years of use. This order is for the Kauii Jewish Community. They are decorated with multi wood mosaics on each of the four circular parts. Etz-Ron’s signature mosaics use more than 30 different woods from all over the world. There are no stains or dyes used on the woods. The colors you see are the natural colors of the woods. You get to experience the different grain patterns and colors of every different wood. 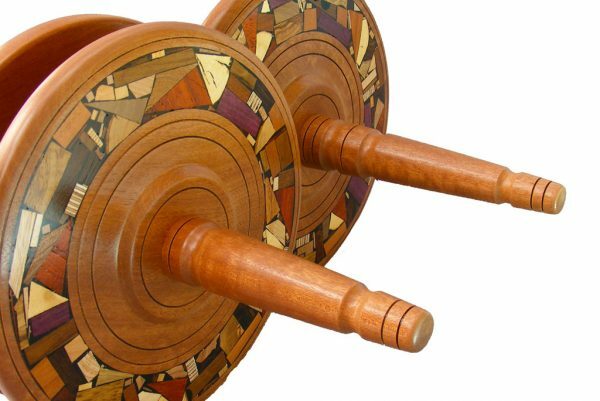 The Torah Rollers come with a “Torah Saver”, which is an additional filler piece threaded on the pole to aid in alignment of the Torah pages while rolling or unrolling. I use Windsor chair joinery techniques on the Torah roller plates and handles to ensure years of uninterrupted use. Sorry, free shipping not applicable with oversized product. Shipping will be prepaid by customer. Boxing Charge of $60 included in price.